CCS Top 100: Congratulations to the following 97 individuals that made it on to the CCS Top 100 All-Time list. Top 100 updates have been completed with the additional events of the Men's & Women's LJ and 300H. SJ Mercury News: Track Athletes of the Year: Weiler (Los Gatos) & Thomas (Mt Pleasant). Surprenant at States: Saratoga News covers the State Meet. Kevin McMahon (Bellermine Throws Coach): comes out of retirement (on a bet) to take another crack at making the Olympic Team. Los Gatos Coaches: Los Gatos HS is looking for coaches for the 2009 season. Matching uniforms for Track & XC: An interesting question was brought up about matching uniforms at the State Meet over the weekend and was presented to Hal Harkness for some clarification, this is what he had to say. Track coaches will love this since it will save on our budgets. Arthur Lydiard: A great article on his training philosophies. Mercury News at States: Covering the Trials & Finals. Surprenant PR's in both hurdle races on Friday - finishes 9th in 300IH on Saturday. State Meet Pix Here. Trials Super Clinic: Up at Hayward Stadium. Fox Athletics: Summer Racing Team - will be going to the JO's in Ohio this summer. Tri-County Running Club: Works out 3 times a week in various locations - starting June 16th. Coach Darrin Garcia (Pioneer): is going to start the A.C.T. Summer track club for any athletes interested in training and running over the summer. All events will be covered, especially hurdling and jumping. Silver Bullets Track Club: Starts May 29th at Homestead HS. More info on the left. Coach Terry Ward (Bellarmine): steps down from coaching after 40 years. Surprenant Takes Gold: Coverage from the Saratoga News on CCS Finals. All Results of LGAC's: The Los Gatos Summer All-Comer Meets will begin on June 19th. Chabot All Comer Meets: Will be starting up on June 24th and will have FAT timing. Lynbrook End Of Year Track Party: Lots of eating, swimming and good times - perfect training for the CCS Finals. Coaches Certification Calendar: Do you need First Aide, CPR? Check out the list of classes for FUHSD coaches. Nico Weiler (Los Gatos): Vaults Off to Harvard. Dolbec Wins: Coverage from the Saratoga News. Sabes Sisters: Track season might be over with once in a life time opportunity. Paly Team Captain Alok Subbarao : tries to improve 10 minutes on Crystal over the course of his HS career. 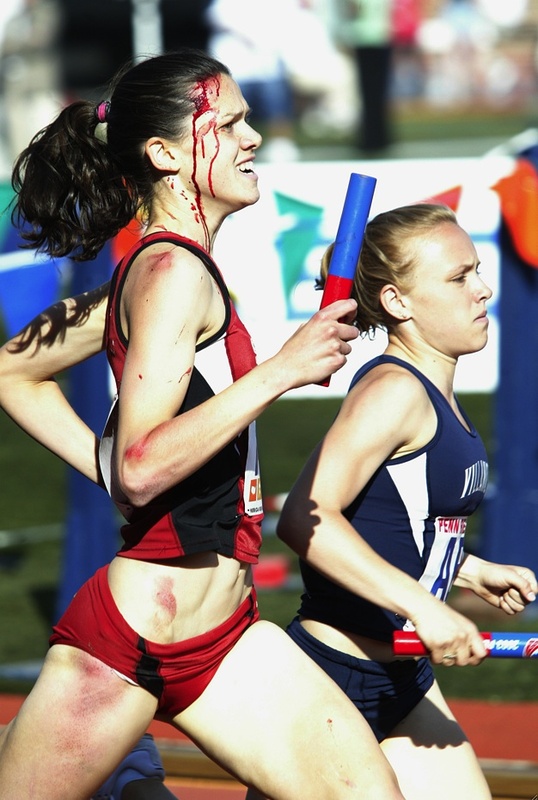 Alicia Follmar (Saratoga/Stanford): running the leadoff leg in the DMR takes a spill, gets a spike to the head and still gets up to finish in 3rd. Vs Saratoga: VB & FSB win (League Champs) while JVG (Co-League Champs) & VG take a loss. More Pix Here. Nico Weiler (Los Gatos): and Josh Cusick (Athlete of the Week) get some coverage from the Merc. Why We Run the Distances We Run: Fun article in America Track & Field on how we came up with some of our running distances. Stacy Dragila: Jennifer Tai (Lynbrook distance runner) reports on the woman that made Pole Vaulting 'cool' for the ladies. Vs Cupertino: Vikes take 3 of 4 (again). They are starting to think about being League Champs. Eric Surprenant breaks two meet records in the hurdles against Cupertino. The oldest being in the 110HH where his 14.7 broke the MR of 14.9 set back in 1969, the oldest record on the books (39 years) until now. Athlete Of The Week: Lynbrook hurdler Eric Surprenant is the Mercury News pick for the week. Gary Price 1958-2008: Ex-Monta Vista Coach Gary Price passes - funeral services on Monday. Stanford Invite - Boys 110HH prelims: Girls 100LH prelims, Boys 400IH (2 heats), Girls Mile (2 heats), Boys Mile, 100H/110H (Girls & Boys). State Meet - 1990: Get a glimpse of Marion Jones winning the 100/200 her Freshman year in HS. Deena Drossin whaloops the field in the 3200, and more. 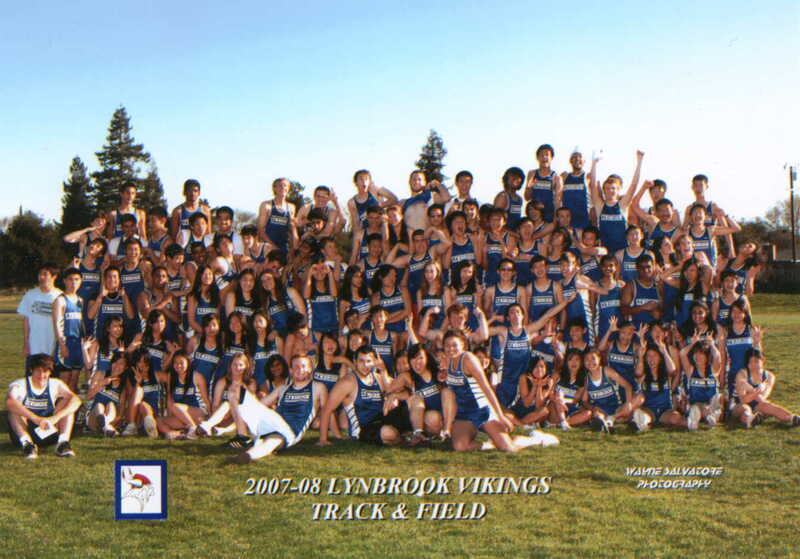 Vs Fremont: Seems to be a habit... Lynbrook wins 3 of 4 only loosing the VG - came down to the Mile Relay however. Pictures to the left. Hampton/Phillips pictures: Picture album of the H/P meet. Paula Radcliffe: Eliza Johnson (Lynbrook distance runner) reports on the current womens World Record holder in the marathon. Runner's Diet: Erica Kenney (Lynbrook distance runner) reports on how trackers do/should eat. Top 100 Boys LJ: It takes 23-00 or better to make the Top 100 All-Time CCS list for the Boys. Alicia Shay: Vicki Ju (Lynbrook distance runner) reports on Alicia Shay. Ryan Shay: Anthony Ding (Lynbrook distance runner) reports on Ryan Shay. Vs Wilcox: Vikes take 3 of 4 with FS & JVG divisions coming down to the Mile Relay (gotta love that)! More Pix Here. 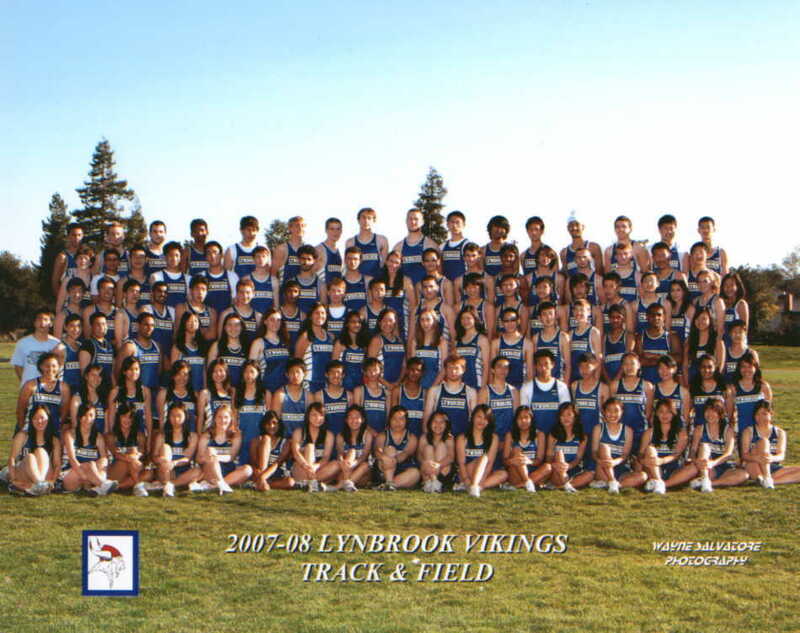 Coach Leo Long (LA): Los Altos HS is dedicating their Track on April 27th to Leo Long who compiled at 128-3 Dual Meet record while coaching at Los Altos. West Valley Relays: Eric Surprenant sets a School Record in the 400IH (54.58) while running a 39.4 split for the 300IH. Brianna Tucker breaks the School PV Record with a 7-00 vault. Ryan Hall: Willie Huang (Lynbrook distance runner) reports on Ryan Hall. Vs Homestead: Vikes take all 4! Girls snag first win in 3 years. More Pix Here. K-Bell Results: Brianna Tucker (Lynbrook) ties the School Record in the Pole Vault. Cindy Huang nabs a 2nd in the 800. Eric Surprenant takes a 3rd and 4th in the hurdles. K-Bell Preview: Jordan Hasay to run 1600 at K-Bell (SJMN story). Pix from Italy&Spain: While in Barcelona, I caught the Marathon. Lead pack at 11K (winner in orange top) and then 20 seconds back the Chase pack - and then everyone else - and of course, the FINISH (course closed at 6 hours). Vs Santa Clara: Lynbrook takes 3 out of 4 with the Varsity Girls still waiting for their 1st win. Shannon Rowbury (SHCP Alum): Rowbury wins USA Indoor 3000 National T&F Title. 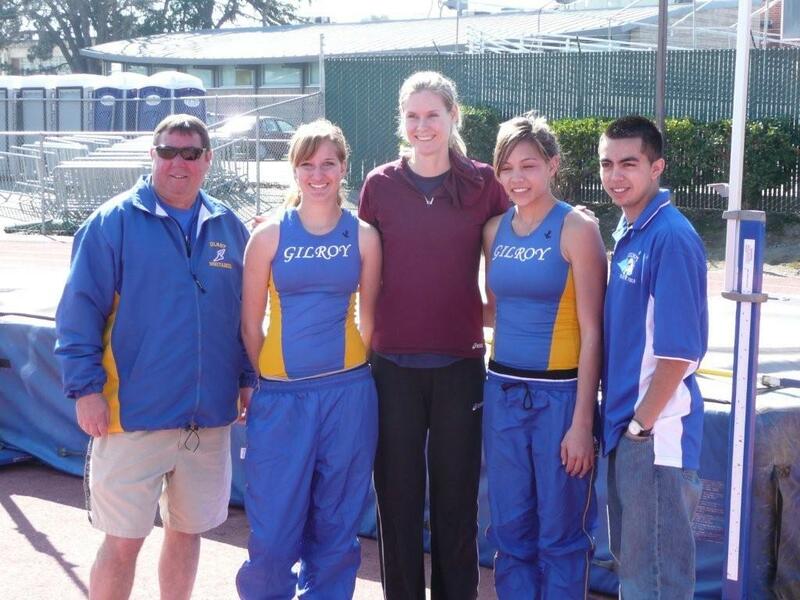 Gilroy & Olympian: Jeff Meyers, Alison Greene, Amy Acuff, Sara Unadia (cleared 5-02 against Live Oak) and Frank Valadez taken at the Olympian Clinic at DeLa Salle HS. Winter Corporate Relays: SCVAL's 8th win in a row at the Winter Corporate Relays. A handfull of folks braved the rain and got to watch Joe King (81) set a new World Record in the mile by 3+ seconds with a 7:13.25 clocking at the final Los Gatos All Comer meet. Runner's High: Erica Kenney (Lynbrook distance runner) reports on endorphins. All Results of LGAC's: The Los Gatos Winter All-Comer Meets. Results 02-23. CCS Pre-Season Preview: Pioneer coaches Darrin Garcia and Archie Ljepava take a crack at summing up the season that is about ready to get underway. '72 Olympics 5K - ouch: Part 1 & Part 2 - I love watching this race, everytime I see it. Lynbrook Winter Break: Workout schedule for Lynbrook HS during Winter Break (2/18 thru 2/22). Campbell Valentine 10K: Beautiful day brought out all the runners and walkers (but no age group records). Olympic Clinic: DeLaSalle HS (NCS) is hosting a clinic on Feb 16th. Lynbrook Track Syllabus: Lynbrook Athletes - read through the Track Syllabus, print off the last page and sign along with your parents - turn in ASAP. Uniform Rule Clarification: Something new on what you can wear under your uniform has been added to the 'Uniform Rule' and it's quite confusing. Ernie Lee (Gunn) has this explanation which he has cleared with Hal Harkness (Rules Guru) and Hal agrees - hope this helps. Cal Berkeley All-Comer Meets: will be held on Feb 9, 16 & 23. Note that they are requiring a signed waiver before you can compete so student athletes, print this off and get your parents to sign the waiver before you show up to the meet. Russian Tunnel: Please be careful when driving this winter. This tunnel in Russia is the longest in-city tunnel of Europe. There is a river running over it and water leak at various points. When the temperature reaches minus 38 degrees like it did this particular winter, the road freezes and the result is the video taken during A SINGLE DAY with the tunnel camera. San Jose CC: Is having two all comer meets on Jan 26 and Feb 2nd - click left link for more details. SCVAL Coaches: The Pre-season Track Meeting will be held on Tues., Jan. 15 at 4:00pm. The meeting will take place at Santa Clara High School in the conference room located in the new administration building. The CCS meeting is Jan 14th at 7:00. Run For The Dream: Jan 21st there will be an indoor meet in Fresno featuring a north vs central vs south track team. Home Page. To the left is the list of BOY runners representing the North - check out the guys team and more meet info. Gilroy All-Comer: meets are also being held on Dec 1, 15 & 29.